Welcome to the wonderful world of tortoiseshell cats and kittens! Tortoiseshell cats are growing in popularity as pets, thanks to their beautiful coats and their inquisitive personality, which is often referred to as tortitude’. Their coats are made up of a rich tapestry of autumn colours, resulting from a complex genetical pattern which also means that the vast majority of torties are female and a male tortoiseshell cat is very rare. What we would usually refer to as a tortoiseshell cat will have a brindled coat with patches of orange, red chocolate and white. The sizes of the patches can vary greatly from large areas of colour to fine flecks, although the areas of white are usually very small on a tortoiseshell. A mainly white cat with larger patches of red and brown is a ‘tortoiseshell and white’ if you are here in the UK, or a calico, if you are one of our visitors from the USA or Canada. 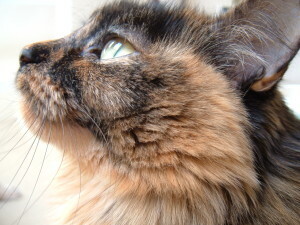 The patches of colour are larger and more distinct on a calico than a tortoiseshell. There are also other variations such as a Blue Tortoiseshell Cat. Most cat owners will bring their pet into their home as a small and fluffy kitten, and you will find that the patches of colour develop as your tortoiseshell kitten matures. She will probably be mainly black when she is very young, with the patches developing over time. The orange, white and black colouring can give your cat the appearance of a mini tiger – it is quite common for the patches to be more prevelant around the legs so you will probably notice them when she settles down for one of her major cleaning sessions! This site will bring you all that you need to know about Tortoiseshell cats and kitten, including tips on looking after your cat, some advice on names, some comfy furniture, recommended cat scratching posts for her and plenty more! We would also love to hear about your examples of tortitude as this is what sets tortoiseshell cats apart and binds their owners together. Also make sure to check out all of the tortoiseshell cat pictures that we have already been sent - we would love to see some more! 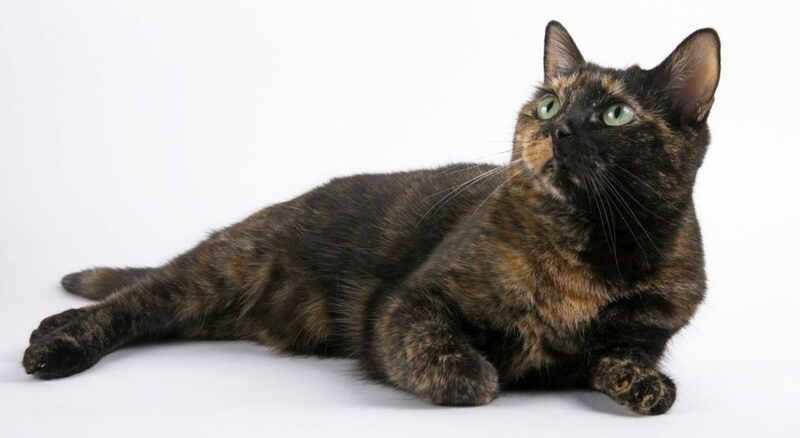 Folklore suggests that torties bring good luck to their owners, and we think that they make the perfect pets – bringing bundles of love, fun and enjoyment to your home. Please also check out our guide to the best cat litter which is an important element of having a cat in your home.